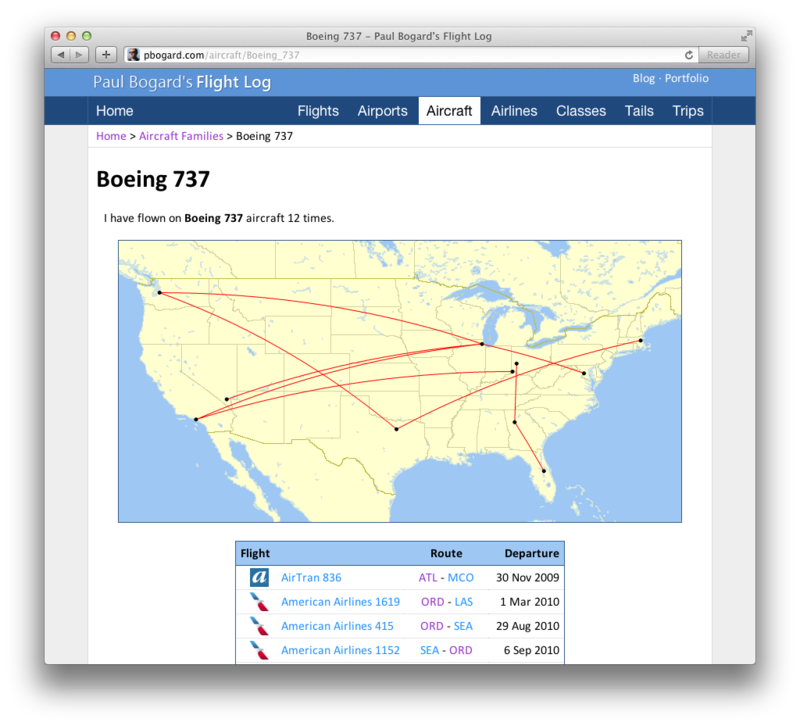 While flights are the most visible aspect of the Flight Log, airports are equally important. 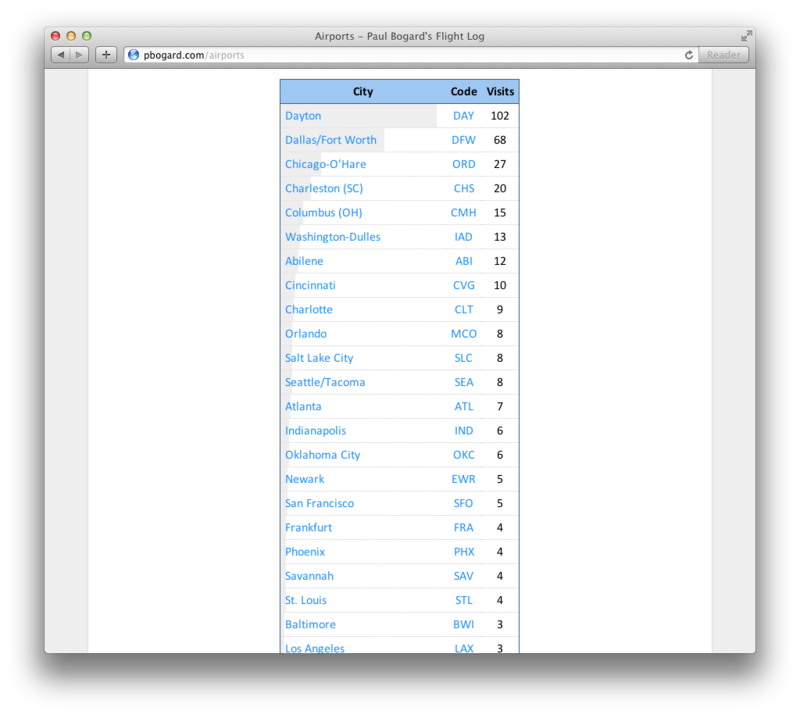 On my airports listing, I start out with some maps showing all airports I’ve been to, but the heart of the page is the list of airports. 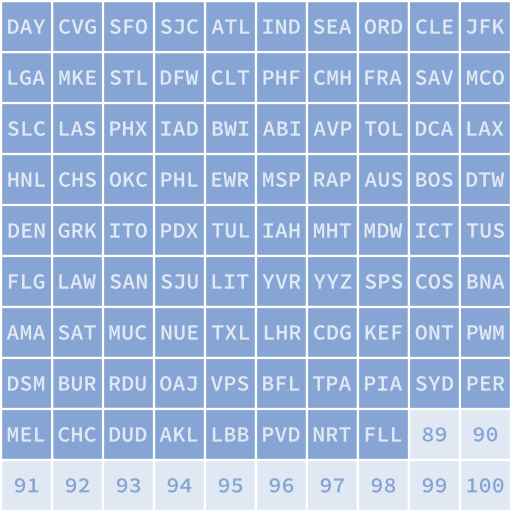 This lists each airport I’ve been to, and the number of times I’ve visited it. 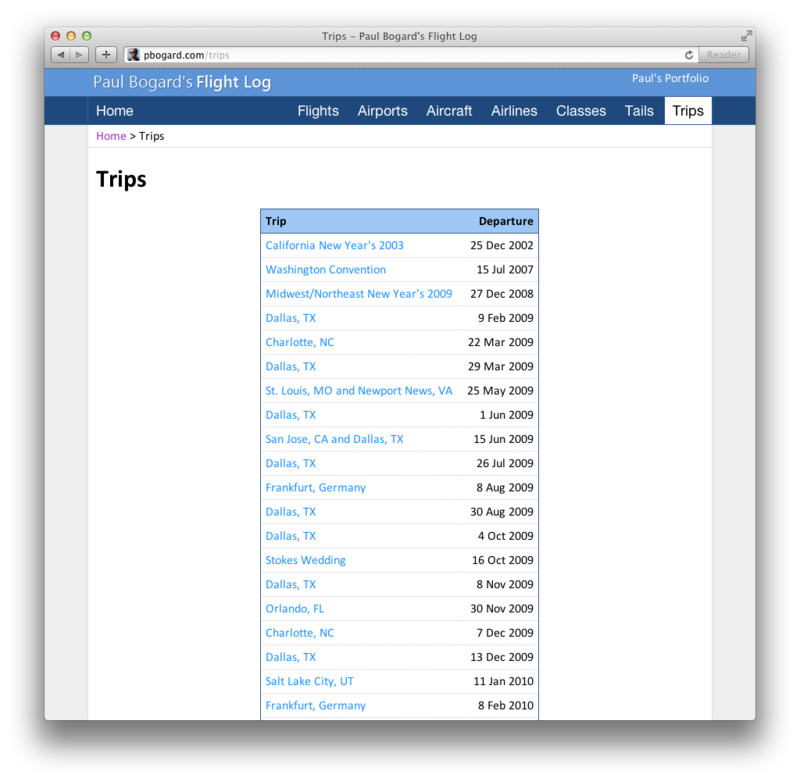 The number of visits is automatically determined from the flight data in the database; every flight has an airport visit at either end of it. 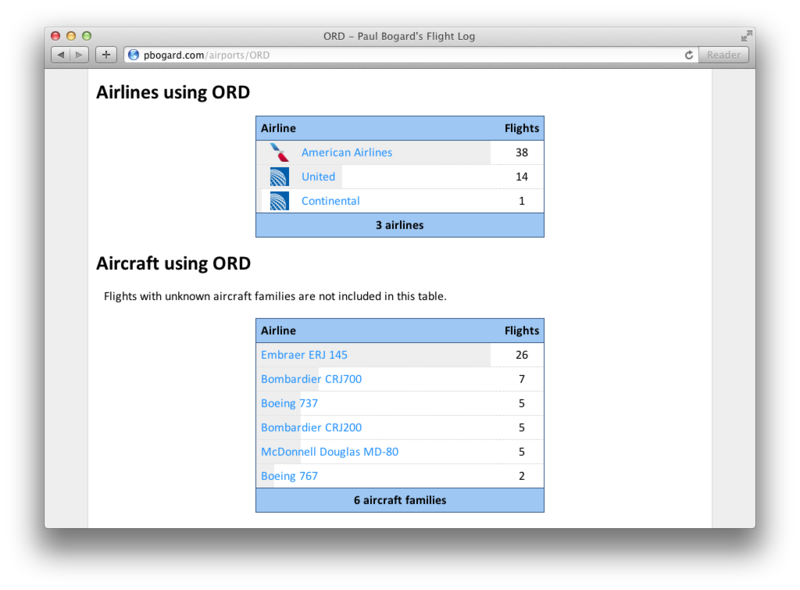 My code also has to look at trip sections to determine if a flight arriving at an airport and the next flight departing from the same airport is a layover or not. 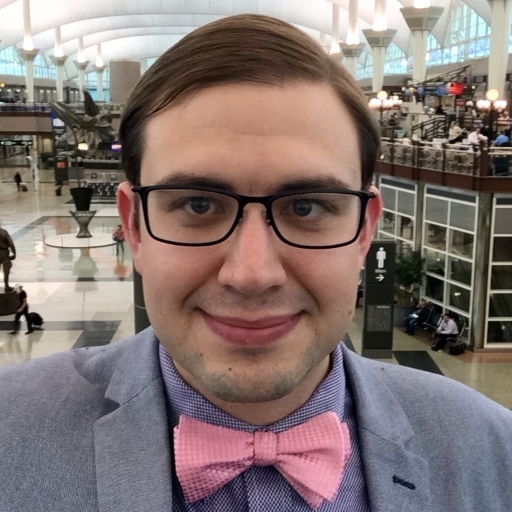 If both flights are in separate sections (for example, I land in Dallas/Fort Worth, do some business there, and then depart from DFW later) it is not a layover and counts as two visits. However, if they’re in the same section, it’s a layover, and only counts as a single visit. 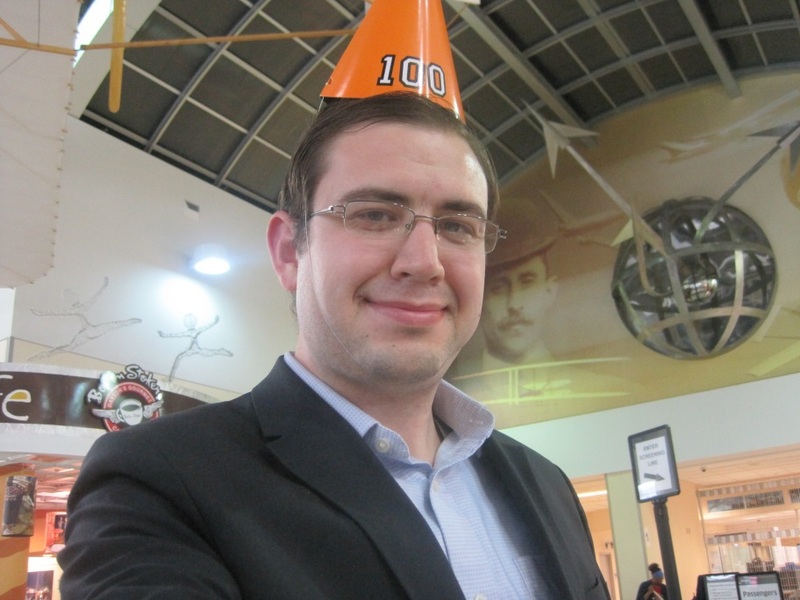 This visit calculation is how I determined when my 100th airside visit to the Dayton airport, allowing me to celebrate accordingly. 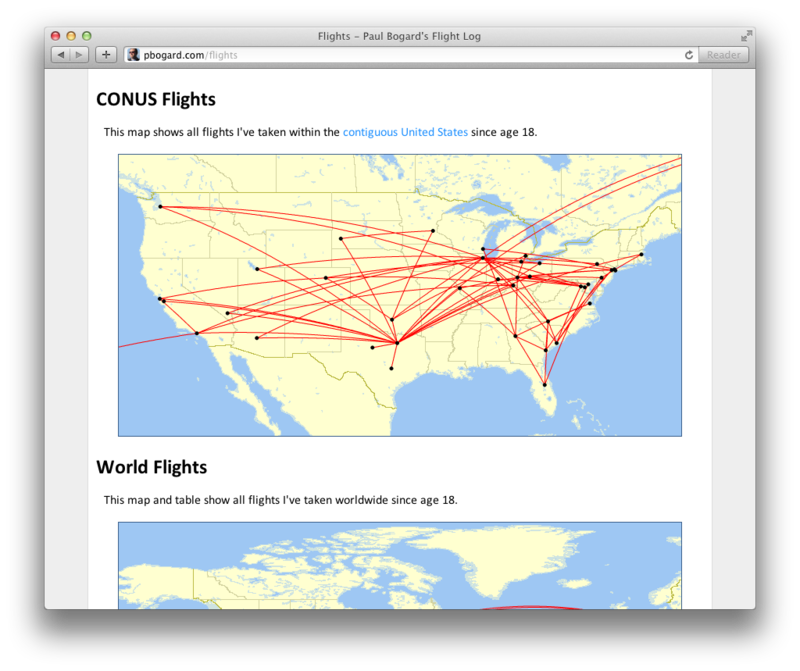 As always, the flight log’s code generates a list of flights and passes it on to the Great Circle Mapper to draw the maps. 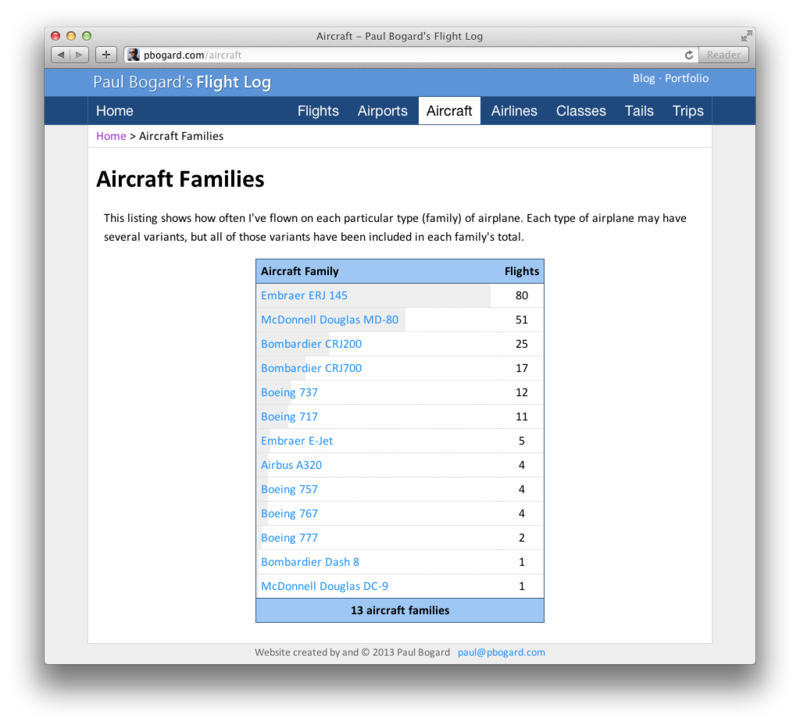 Clicking on any airline or aircraft family will bring up details about each, which will be discussed in the next entry. 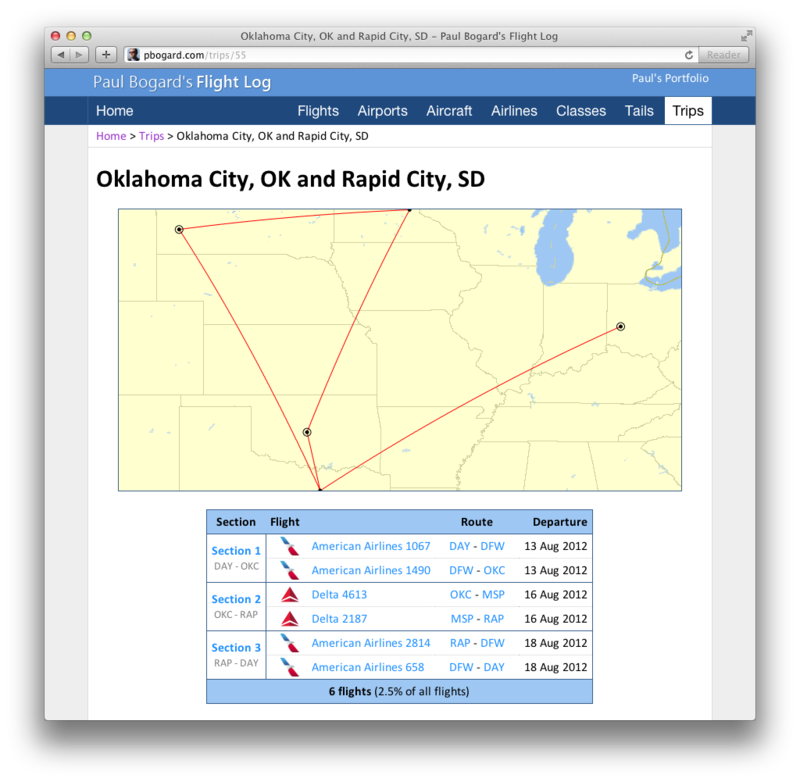 The Flight Log has a number of ways to show information, but understandably, the core component is a list of flights. 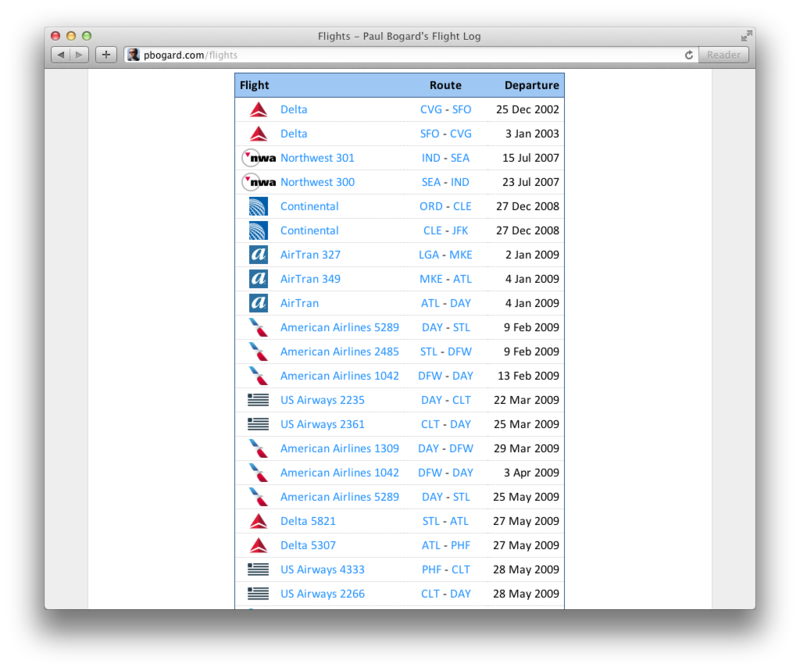 The most prominent item on the flights listing is a pair of maps showing every flight I’ve taken since age 18. 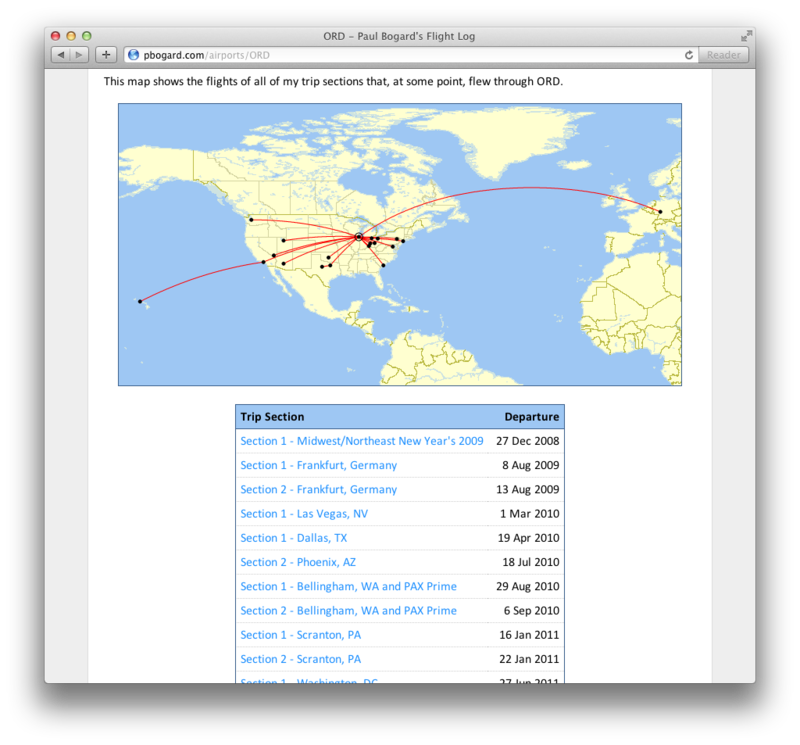 I have a database of all the flights I’ve taken, and I wrote some code to take all of this flight route data and transform it into a format that the the Great Circle Mapper understands, and the Great Circle Mapper generates me a map like the one above. 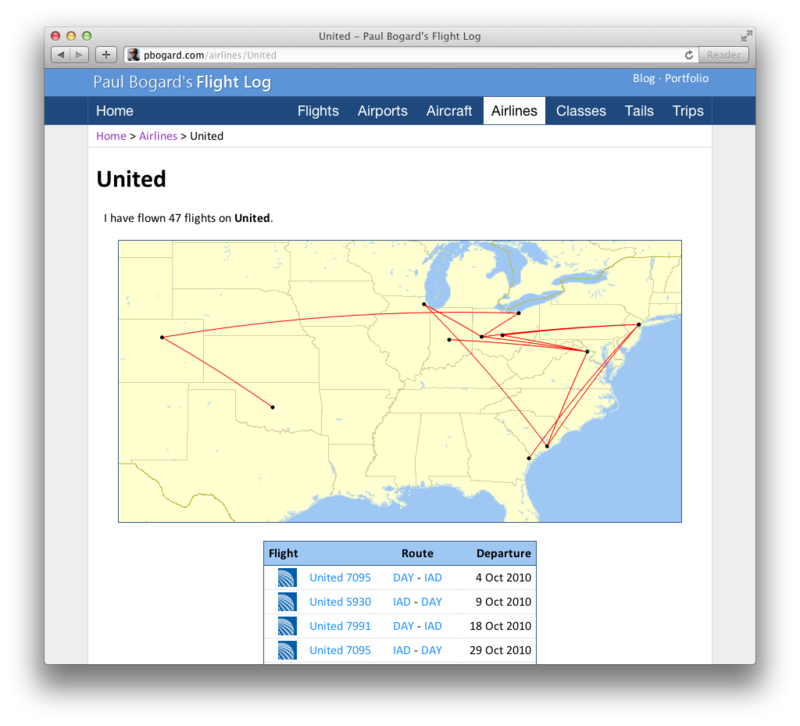 This means that when I add a new flight to the database, my maps are updated automatically. Of course, while maps are useful, sometimes more details are needed, and for that I’ve included a listing of all of my flights. 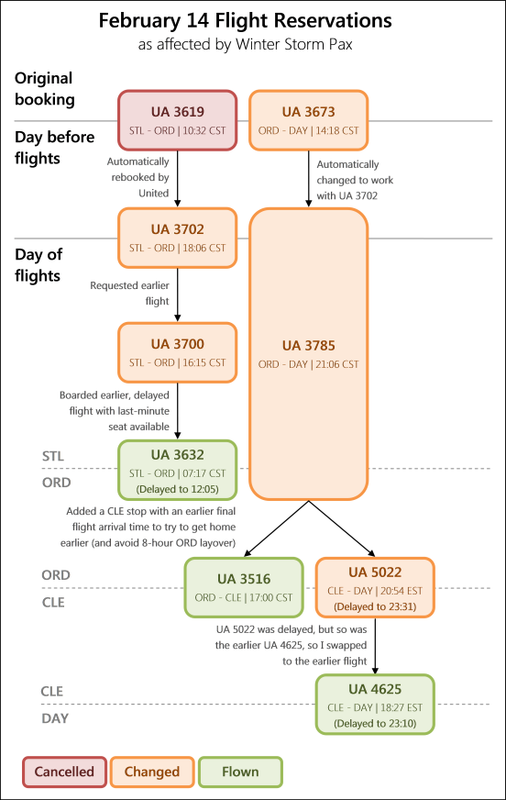 This page shows a map of the flight and a number of details. Many of these details are links – so clicking on First Class, for example, brings you to a page listing all of my first class flights. (The various details will be covered in future posts.) The page also shows some maps of trips (and parts of trips) which have a flight involving these two cities, so this is as good of a time as any to describe how trips work. 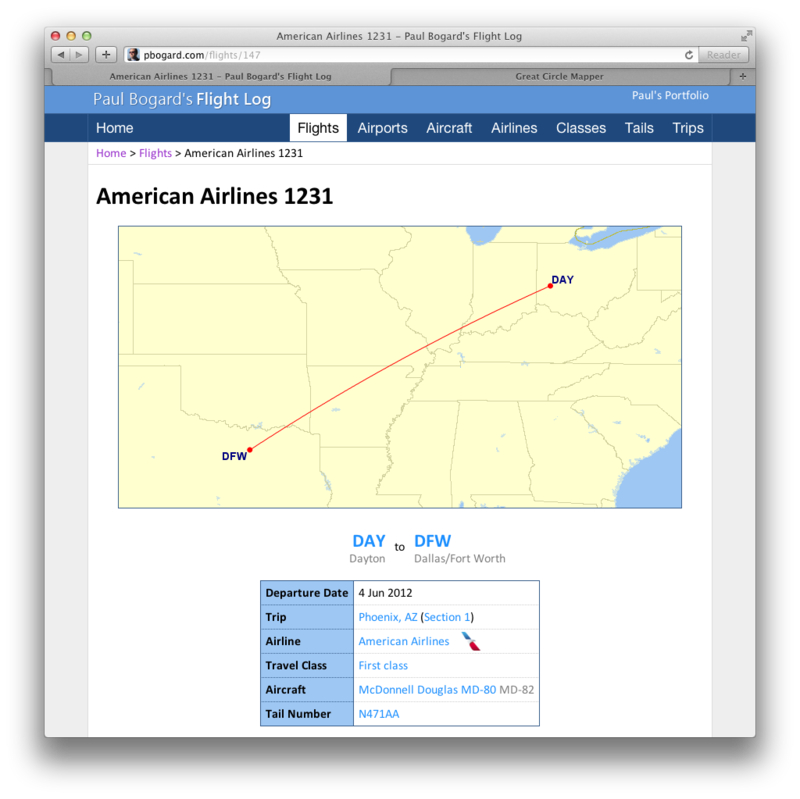 For the purpose of my flight log, a trip can be divided into one or more sections. A section is simply all the flights between the origin and the first destination, or between any two consecutive destinations. So, let’s say that I have a round trip from my home in the Dayton, Ohio area to Los Angeles, with a layover at Dallas/Fort Worth both ways. This trip would then have two sections – the first containing all of my flights to Los Angeles (the DAY to DFW flight and the DFW to LAX flight) and the second containing all of my flights home (the LAX to DFW flight and the DFW to DAY flight). 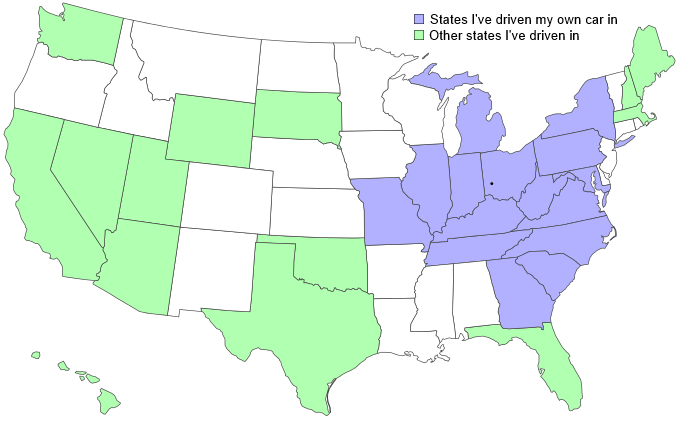 If I had a multi-city trip from Dayton to Los Angeles to Seattle to Dayton, there would be three sections – All flights between DAY and LAX, all flights between LAX and SEA, and all flights between SEA and DAY. 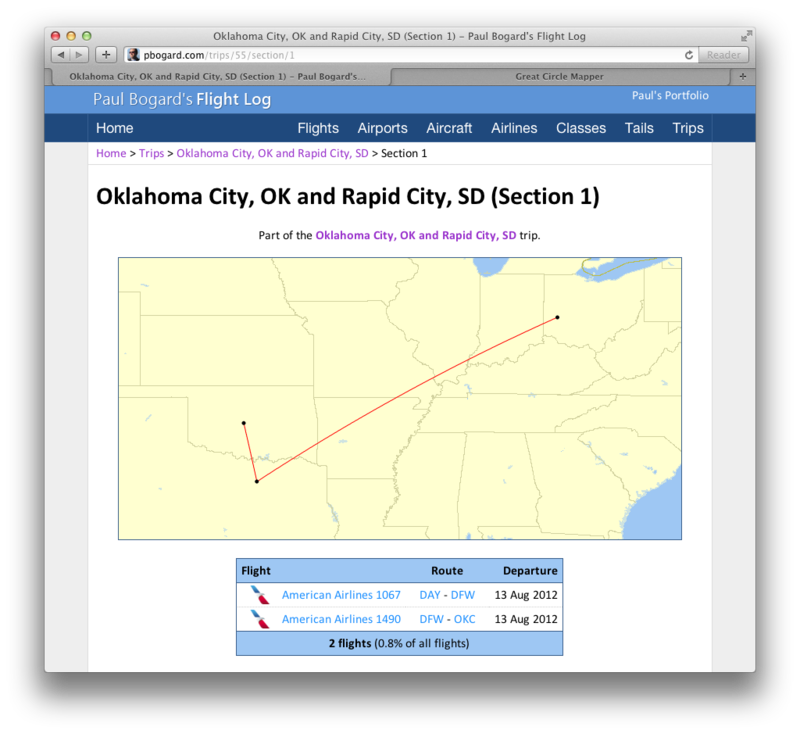 This particular trip was a multi-city trip, starting and ending in Dayton with stops in Oklahoma City and Rapid City. As you can see, the map highlights destinations with a ring around a dot, while airports that are simply layovers are just shown as a black dot. Between the flights and trips pages, my travels are well-described. However, there are still more in-depth flight details included in the Flight Log, which will be covered in my next entry. 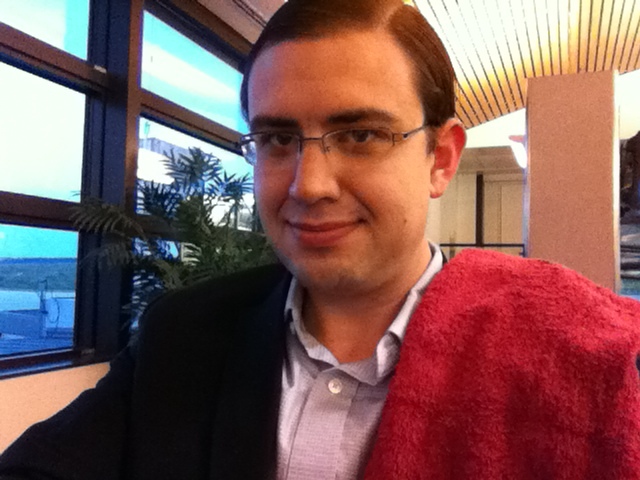 I travel reasonably often, and I consider myself a bit of a transportation nerd. It’s only logical that I would keep track of where I’ve flown. 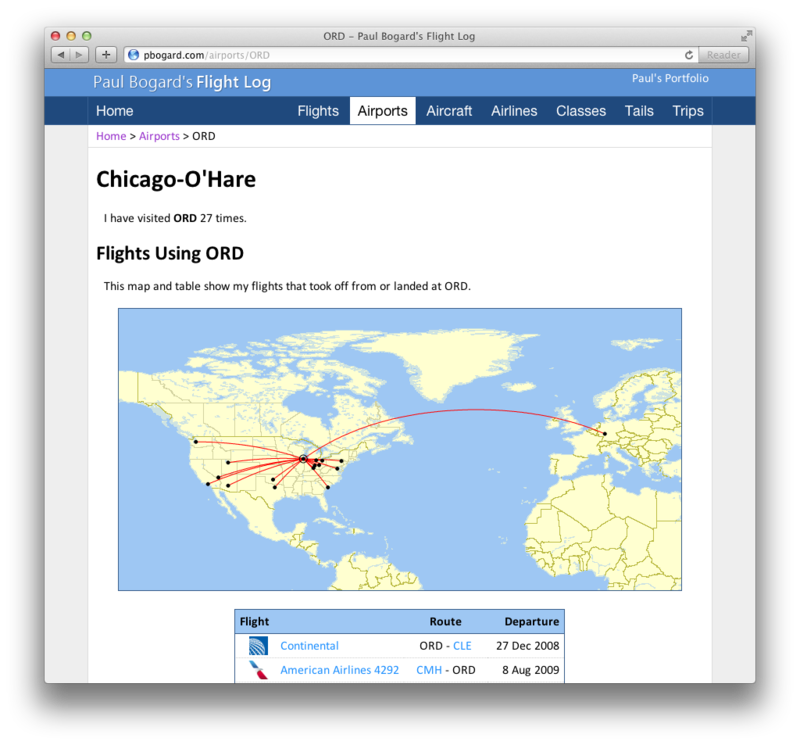 For a while, I used a giant text file, and later an Excel spreadsheet, to track all of my flights; I created maps manually using the Great Circle Mapper. 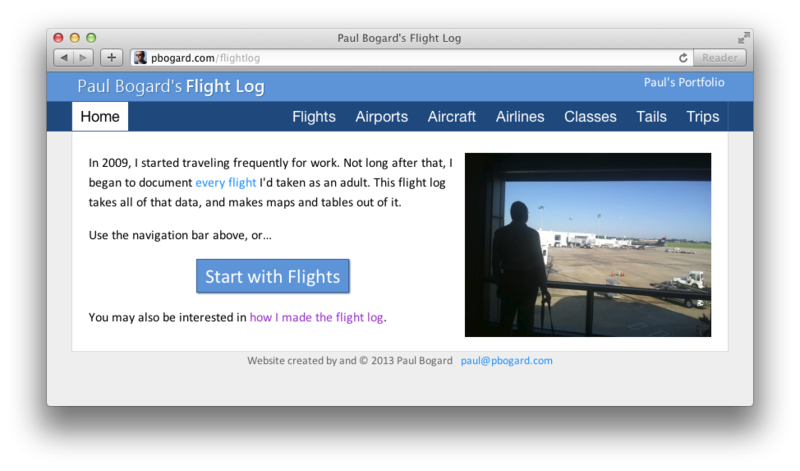 But by the time my flights began numbering in the hundreds, I needed a more automated solution, so I created Paul Bogard’s Flight Log. 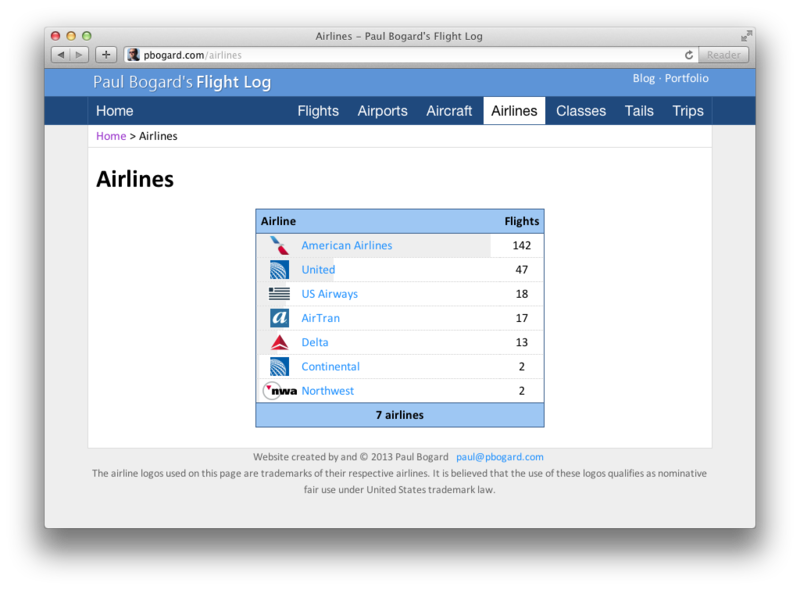 Over the next several weeks, I’ll go into detail about the Flight Log’s features.